Jan. 7 (Bloomberg) — Sao Paulo state Governor Jose Serra, the likely opposition candidate in Brazil’s presidential election, is more likely to address the country’s long-term economic challenges, JPMorgan Chase & Co. said in a report published today. “Much is at stake in terms of long-term planning for the country now that the stabilization phase is over and Brazil is entering what appears to be a solid growth phase,” JPMorgan said. Cabinet chief Dilma Rousseff, the candidate favored by President Luiz Inacio Lula da Silva, would likely boost the state’s “intervention” in the private sector, JPMorgan said. RIO DE JANEIRO (Reuters) – Standing defiantly in front of his mother, the skinny boy orders his drunken father to stop beating her. “Why?” growls the swaying man. The exchange in a sympathetic new film portraying the life of Luiz Inacio Lula da Silva gives a glimpse of the guts and charisma that helped him to the top of Brazil’s most powerful labor union and eventually to the national presidency. “Lula – Brazil’s Son,” opened in cinemas this week, telling the remarkable story of Brazil’s first working-class president and angering political rivals who say it is a two-hour campaign ad ahead of elections this year. The movie, which at 12 million reais (about $7 million) reportedly boasts the biggest budget in Brazilian film history, caps a year in which the 64-year-old former metalworker and union boss cemented his place among the world’s most popular and successful leaders. Brazil’s economy rebounded strongly from the global financial crisis, helping keep Lula’s approval ratings above the 70-percent level that has become routine since he was elected president in his fourth try in 2002. The icing on the cake came in October when Lula’s efforts helped Rio de Janeiro win the race to host the 2016 Olympic Games, seen as the latest landmark in Brazil’s rise as a global power after decades of underachievement. But the timing of the film ahead of elections in October and its largely gushing portrayal of Lula’s early years have given the movie’s release a distinctly political tinge. Opposition politicians have slammed it as an election broadcast that aims to boost the chances of Lula’s chosen presidential candidate, chief of staff Dilma Rousseff. Lula cannot run for a third straight term. The movie’s funding by 18 companies, ranging from construction firms to car makers, some of which have major contracts with the Lula government, has also been seized on by the opposition as evidence of unfair political propaganda. Ronaldo Caiado, the leader of the opposition Democratas Party in the lower house of Congress, said the firms’ ties to the government meant that public resources were effectively being used to promote Lula’s legacy in an election year. “It would be fine to make a film after his political life is over, but trying to turn him into a myth in an election year is obviously influencing the electoral process,” said Caiado, who has asked the government to provide details on contracts with the film’s patrons. The Lula camp has dismissed the criticism as partisan grumbling, insisting the government had nothing to do with the film’s timing. Still, leveraging Lula’s huge popularity and recognition into votes for the little-known Rousseff is one of the central strategies of the ruling coalition, which faces a tough fight to retain the presidency against Sao Paulo state Gov. Jose Serra, the likely main opposition candidate. Opposition tempers have been further frayed by deals allowing millions of union members to get cut-price tickets for the film, raising its potential electoral impact. The film’s director Fabio Barreto insisted in a December interview with Estado de Sao Paulo newspaper that the sponsors only backed the film for commercial reasons, saying he had been shocked at the vitriolic nature of some of the criticism. “Lula isn’t getting a ride on the possible success of the film, it’s us who are getting a lift from his popularity to make a popular success,” Barreto said in the interview. Barreto, the youngest son of a well-known family of Brazilian film producers, was seriously injured in a car accident shortly after the interview and remains in a coma. The movie chronicles Lula’s birth as his mother’s 7th child in the dusty, poor northeastern state of Pernambuco, his father’s alcoholism and violence, his family’s 13-day journey to the industrial southeast, his work as a shoeshine boy and then a lathe operator in Sao Paulo. The action ends in 1980 with his brief imprisonment by the military dictatorship for leading a metalworkers’ strike and the death of his beloved mother Euridice. “Leaving aside political questions, as cinema “Lula – Brazil’s Son” is basically a bad film,” wrote film critic Ricardo Calil. Washington needs to rethink its assumptions on South America. Until recently, the Obama administration assumed that Brazil and the United States were natural allies who shared many foreign policy interests, particularly in Latin America. Brazil, after all, is a friendly democracy with a growing market economy and Western cultural values. It will soon be the fifth largest economy in the world. It recently discovered billions of barrels of petroleum in the deep waters off its coast and is an agricultural powerhouse. It has also made significant progress in eradicating poverty. It therefore seemed only natural to expect that as Brazil became “more like us,” it would seek to play a more active and constructive role in this hemisphere, and that U.S. and Brazilian political and security interests would largely coincide. This now seems like wishful thinking. On a number of important political and security issues, Washington and Brasilia recently have not seen eye to eye. Nor has Brazil shown much leadership in tackling the important political and security challenges facing the region. One example is Brazil’s role in UNASUR (Union of South American Nations). At a September meeting in Quito focused on regional security issues, topics not discussed included the multibillion-dollar arms race in the region, the granting of sanctuary and other forms of aid by Venezuela to the Revolutionary Armed Forces of Colombia (FARC), a Colombian narco-guerrilla group, and the growing nuclear cooperation between Iran and Venezuela. Instead, Brazil joined UNASUR in criticizing Colombia for having agreed to allow the U.S. to use seven of its military bases for counterterrorist and counter narcotics activities inside Colombia. The fact that Colombia has been under attack by an armed guerrilla group supported by some members of the Union was not considered relevant to the organization’s decision to criticize Colombia for seeking help from Washington. Furthermore, none of the democratic countries in South America, including Brazil, has offered military or even rhetorical support to besieged Colombia. Another example is Brazil’s changing position concerning the importance of democratic governance. Both Brazil and the U.S. initially opposed the Honduran military’s removal from office of the democratically elected president, Manuel Zelaya, despite the fact that Mr. Zelaya had violated Honduras’s constitution. Brazil’s interest in democracy in Honduras does not, however, extend to Cuba. Only weeks earlier, Brazil voted in the Organization of American States to lift the membership ban on Cuba—a country that has not held a democratic election in 50 years. This decision contradicted the organization’s democratic charter. Brazil also has never tried to mobilize support against Venezuelan President Hugo Chávez’s use of democratic institutions to systematically destroy that country’s democracy. On the contrary, Brazil’s President Lula da Silva is supporting Venezuela’s efforts to join Mercosur (a South American customs union), despite rules that limit membership to democratic countries. 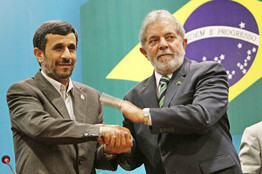 Brazilian President Lula da Silva, right, and Iranian President Mahmoud Ahmadinejad. Finally, there is the issue of Brazil’s apparent lack of concern regarding Iran’s increasing penetration into Latin America through Venezuela. There are now weekly flights between Caracas and Tehran that bring passengers and cargo into Venezuela without any customs or immigration controls. Venezuela has also signed agreements with Iran for transferring nuclear technology, and there is speculation it is giving Iran access to Venezuelan uranium deposits. Instead of expressing concern over Iran’s activities in Latin America, Brazil is drawing closer to Tehran and hopes to expand its $2 billion bilateral trade to $10 billion in the near future. President Lula recently hosted President Mahmoud Ahmadinejad in Brazil. He reiterated his support for Iran’s right to develop nuclear technology for peaceful uses, while insisting that there is no evidence that Iran is developing nuclear weapons. Several conclusions can be drawn from Brazil’s behavior. First, Brazil wants to prevent the U.S. from expanding its military involvement in South America, which Brazil regards as its sphere of influence. Second, Brazil much prefers working within multilateral institutions, rather than acting unilaterally. Stated differently, Brazil’s multilateral efforts in the region seem to value the appearance of leadership over finding real solutions to the growing political and security threats facing Latin America. These conclusions do not imply that the U.S. and Brazil have no overlapping interests, or that they cannot work together to solve particular regional or even global issues. They do mean Washington may need to rethink its assumptions regarding the extent to which Brazil can be relied on to deal with political and security problems in Latin America in ways that are also compatible with U.S. interests. Ms. Purcell is the director of the Center for Hemispheric Policy at the University of Miami. You are currently browsing the Waldemar Jezler's Weblog blog archives for January, 2010.